Thank You - So That's How You Do That! Your Subscription to my Tips and Guides was a success! I hope that you enjoy the exclusive tips and guides that you will be receiving from me. I will also send links to videos that I would like to share with you, so please be sure to whitelist me in your email. Also, check out the site for all it has to offer. I am always adding new posts to my blog and they are packed with lots of helpful information to help guide you through your Flooring Installation. Be sure to check out the Tile Installation Guides. Click on the tab at the top of any page to get there. I will be sending you another email in a moment. This will have the link you need to get to your Project Planner. So be sure to check your email once again! But in the meantime I would also like to give you one more Gift. Here is a link to 5 videos that will show you how to prep your walls and floors. 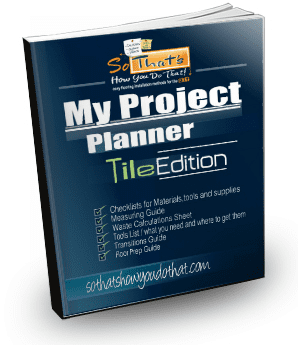 This is very important so you can have the best tile installation possible. It’s great to know that this information is coming from a fellow believer! Praise the Lord. It is good to meet a anmother Brother serving the Lord! Thank you and I yes it is great to meet others who know the Lord. My hope is for more to know Him.